A quintuple rocket launch promises to put on a spectacular, but brief, overnight light show of luminescent vapor trails in the skies above the U.S. East Coast tonight, weather permitting. The sky display may puzzle and amaze some unsuspecting observers, so before you make that phone call to your local news or police, here is why this is happening and when you may see it. The bright phenomenon will be caused by NASA's Anomalous Transport Rocket Experiment (ATREX), which will launch five chemical-bearing suborbital rockets in about five minutes to test the flow of winds and electrical currents at high altitudes. The rockets will blast off from NASA's Wallops Flight Facility on Wallops Island, Va., on the Atlantic coast during a window that opens tonight at midnight EDT (0400 GMT) and closes at 1:30 a.m. EDT Thursday (0530 GMT). As part of the mission, the five rockets will each release a chemical tracer that should inscribe brilliant milky white trails in the nighttime sky and allow scientists and the general public to actually "see" high-altitude winds at the edge of space, according to a NASA description. 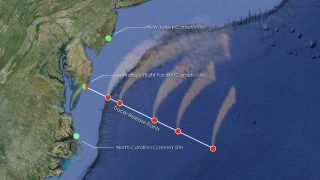 If all goes well, NASA intends to photograph the trails from three different sites: Wallops Island, southern New Jersey and the outer banks of North Carolina. Should weather conditions be unfavorable, the firings will be delayed to another night, with alternate launch dates available between March 16 and April 3.